Lanthanum cerium oxide (LaxCeyOz) has been successfully spin-coated on Si substrate with post-deposition annealed from 400 to 1000°C for 15 min in argon ambience. X-ray diffraction has detected the presence of LaxCeyOz phases oriented in (200), (220), (311), and (222) planes and field emission scanning electron microscopy revealed a smooth surface in all of the samples. Grain size of LaxCeyOz film determined using Williamson-Hall method increased with the increase of annealing temperature. 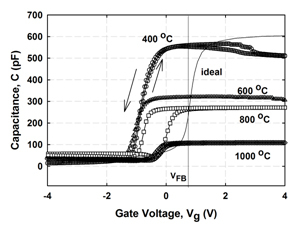 Leakage current density-gate voltage (J-V) and capacitance-voltage measurements showed that the highest breakdown voltage was obtained by sample annealed at 1000°C, corresponding to the acquisition of the lowest effective oxide charges, the smallest interface trap density, and total interface trap density.